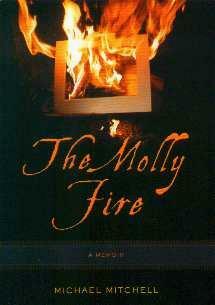 This book was nominated for the Governor General's Literary Award in 2005, in Canada. Author Michael Mitchell, an anthropologist, writer, filmmaker, and photographer, writes about the death of his artist mother, and more. I found the book disjointed in that it kept randomly moving from one subject to another, forcing me to stop and think about what was going on and why he changed lanes so often. Although well written, and expressive, I didn't like losing my way all the time. It didn't flow. A little bit about him, a little bit about his childhood, bits about his mother's death, his current anthropolgy work, his mother's childhood, back to him, his father - see what I mean? Maybe it's just me - maybe this book is too literary for my likes. I just know I found it disconcerting to keep wondering where I was and who I was reading about and why it wasn't more about his mother, Molly. He goes through her possessions after her death and recalls memories from days gone by. Conclusion - Too much chopping and changing to really appreciate what he was writing about.